I received issue CV of Eurohistory. 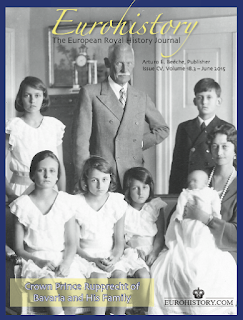 The European Royal History Journal earlier in October and finished reading it this week. The issue was delayed due to the printer having a "major press malfunction", as told by Eurohistory's blog on 22 September this year. I hope the magazine will come back on track soon. There is at least no reason to complain much about the magazine's contents, as I really enjoyed reading it. The front cover shows a photo of Crown Prince Rupprecht of Bavaria and his family. Most, if not all, of the family members can be identified by comparing with other photos in the article Crown Prince Rupprecht. The Best King Bavaria Never Had (Part I) by Coryne Hall, but I still wish the editor could have given a photo caption on the following page. The second article is titled Frederica of Hanover. A Passionate & Obstinate Princess (Part II) written by Marlene A. Eilers Koenig. The first part was published in issue CIV (Vol. 18.2, April 2015). Frederica (Friederike) (1848–1926) was the 2nd child of King Georg V of Hannover and Queen Marie, née Princess of Saxe-Altenburg. In 1880 she married Baron (Freiherr) Alfons von Pawel-Rammingen (1843–1932) against the wishes of her family. The marriage was, however, supported by Queen Victoria and other members of the British royal family. All in all a well-researched and well-written article about a princess I would say belong to the group of "lesser-known royals". Ilana D. Miller is another more or less permanent contributor to the magazine, and this time she continues her series Who Is In The Photograph with the subtitle A Gathering in Hesse, showing Prince Philip, Duke of Edinburgh, Princess Margaret of Hesse and by Rhine, née Campbell-Geddes, Landgrave Moritz of Hesse(-Kassel) and Princess Sophie of Hannover, née Princess of Greece and Denmark. The latter is of course an elder sister of Prince Philip, while Moritz was the nephew of Princess Sophie's first husband. Miller then goes on to give a presentation of the said persons and how they are related and interacted. I have earlier commented that I would like more variation in topics in both the ERHJ and the Royalty Digest Quarterly, as I sometimes have felt that the topics are just circulated. There are so many people from so many royal, princely and mediatised houses to write about! So all of a sudden, Greg King and Janet Ashton appear with the brilliant article The Extraordinary Life of Princess Catherine Radziwill. Perfect Liar. The princess was born as Countess Ekaterina Adamovna Rzewuska in St. Petersburg in 1858 and died in New York City in 1941. She was twice married, first to Prince Wilhelm Radziwill and secondly to Karl Emile Kolb-Danvin, and is known first of all for her many books filled with behind-the-scene details and some times gossips about the various courts of Europe as well as for her extramarital affairs. I have come across her name from time to time due to her writings, but I have never read anything about her, so it was such a thrill so learn so much. Now, Radziwill is of course a well-known princely family, but articles about the family appears less often than articles about the Romanovs and the Windsors, so I was very pleased about the topic. Both well-written and well-researched. And it is only the first part! The authors' analysis of Princess Catherine Radziwill's writings is interesting: "In the last few decades [...] it has become fashionable to dismiss her as completely unreliable. But what is the truth? These books are, by turns, sympathetic, controversial, illuminating and outrageous, and many reflect Catherine's changing views and motivations. Caution is certainly advisable when considering Catherine as a source, yet contrary to current opinion careful analysis now reveals that many do contain accurate information and informed views. Outright rejection of Catherine's books – and some of their more uncomfortable content – as mere vituperative gossip, as we'll discuss in the second part of this article, does her, and history, a disservice." We really have something to look forward to! The last article of the present issue, written by the magazine's editor and publisher, Arturo E. Beéche, covers the wedding of Prince Carl Philip of Sweden and Sofia Hellqvist on 13 June 2015. (Princess Sofia's pregnancy was, by the way, announced by the court on Thursday 15 October while I was on a work trip to Brussels and unable to write about it.) The author mixed up Prince Carl Philip's birth date (9 June 1979) with that of his christening (31 August 1979), but that belongs to the kind of mistakes which one is bound to make from time to time with so many details having to be pressed into two pages. You think one thing and write another. It happens to everyone, including me! The magazine might spend more resources on proof-reading, though, for in the Royal News section we are told that Princess Madeleine's second child, born on 15 June 2015, was named Paul Gustaf. The main name Nicolas was in other words left out. But such mistakes are far from representative when we look on the magazine as a whole. Finally, the traditional Royal News section, and this time the imperial, royal or princely families of Austria-Este, Hannover, Sweden, United Kingdom, Ysenburg and Büdingen as well as Osuna (Spanish ducal family) are covered. Updated on Wednesday 28 October 2015 at 11 p.m. (typos corrected).